the host and refugee churches united in purpose and mission. disciples growing and multiplying among the refugee and host communities. the pain of war being brought to the cross of Christ, and people finding freedom. the entire refugee population of more than 135,000 in Mabaan county coming to Christ. Teaching, discipling, modelling a faithful Christian walk in order to equip the church to reach their neighbours and the least reached for Christ. This ministry proceeds from our conviction that no one should live and die without having a chance to hear, understand, and believe the gospel. Our aim is to introduce people to Christ. Enseñar, discipular, modelar un fiel caminar cristiano para equipar a la iglesia para alcanzar a sus vecinos y a los menos alcanzados para Cristo. Este ministerio procede de nuestra convicción de que nadie debería vivir y morir sin tener una oportunidad de oír, entender, y creer en el Evangelio. Nuestra meta es presentarles a Cristo a las personas. The Jumjum, a community from Sudan’s western Blue Nile state, have made their home in the refugee camps in Doro, South Sudan. 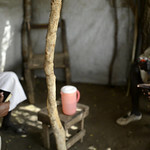 They fled the fighting of 2011, following the independence of South Sudan. A number of missionaries have reached out to the Jumjum. When fighting erupted in Doro on Christmas Day, 2016, the missionaries were evacuated for a time. 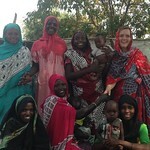 The Jumjum women continued to meet with one another to share the Word. May this fire of the Gospel spread throughout the majority Muslim tribe! Much like the Jumjum, the Nuba community borders the former Upper Nile state. A number have crossed into South Sudan fleeing the fighting and searching for safety. They are also from a majority Muslim area. 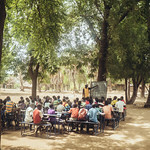 They are a minority in the camps, but had a small church near the airstrip. Fighting on Christmas Day 2016 meant they had to abandon it. Pray for Nuba believers to remain strong, and that the Lord would minister to them in their hardships. Pray for communities fleeing war in Sudan and taking refuge in South Sudan, that they would come to know Christ. Pray for hearts wounded by trauma to find their rest in Christ. Pray for our relationship with the host community to continue to grow strong. Pray for the church to be strengthened and to speak prophetic words of challenge, as well as soothing words of healing. 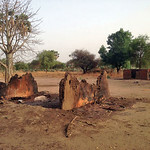 Pray for the Lord to give grace to our team in Doro, who live in an environment of great tension and insecurity.